Growing up on a wildlife refuge in Minnesota, Lynn Christensen wanted to know what it was like to sleep under the stars. So she grabbed her bedroll, some matches to start a campfire, a can of pork and beans, and a single companion—her horse. She was 10 years old. Christensen, who serves as senior vice president of applications development at Workday, thrives on setting goals and reaching them, no matter how challenging the journey. 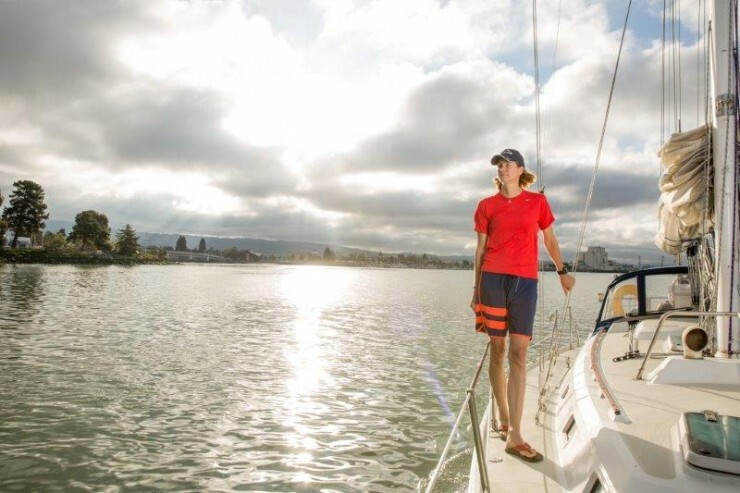 She’s sailed from California to Hawaii twice. Earlier this year, she joined the spiritual walk through Spain known as Camino de Santiago, backpacking for five days through rain, sun, and blistered feet. Most mornings before work, Christensen rises before dawn and hits the chilly waters of the Oakland estuary in the San Francisco Bay to hone her paddleboard skills. She took up the sport a year ago and has competed in five paddleboard races, winning three of them. “As long as you have purpose and passion, and put hard work into it, you can do anything you set your mind to doing,” says Christensen. Yet on the outside of this tough core is a warm and open person, full of self-deprecating humor and folksy Midwestern charm. For this profile interview, Christensen is wearing a polo shirt, jeans, and blue suede tennis shoes. She folds her tall, athletic frame into a chair and gamely answers questions, her blue eyes dancing as she talks about Workday and her role here. 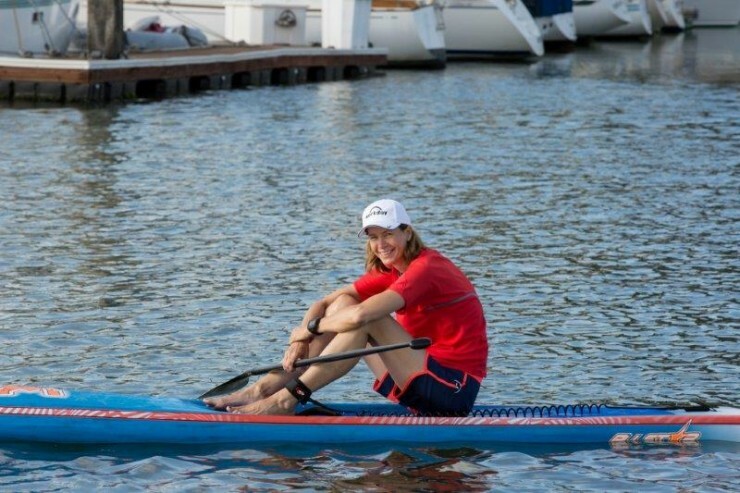 Christensen has competed in five paddleboard races, including an 8-mile race off the coast of Hawaii. Christensen oversees development of all of Workday’s cloud-based enterprise applications. It’s her responsibility to ensure new and updated applications meet product goals and are delivered on time. It’s a big job, requiring the vision and awareness of a symphony conductor. Christensen oversees multiple teams and closely collaborates with Workday’s product development and technology development organizations. Yet she also must stay close to the technical aspects of building products, ensuring applications meet customers’ performance and quality expectations. Petros Dermetzis, executive vice president of development at Workday, hired Lynn in 2012 to head up Workday Financial Management development. In March 2015, she was promoted to her current role. 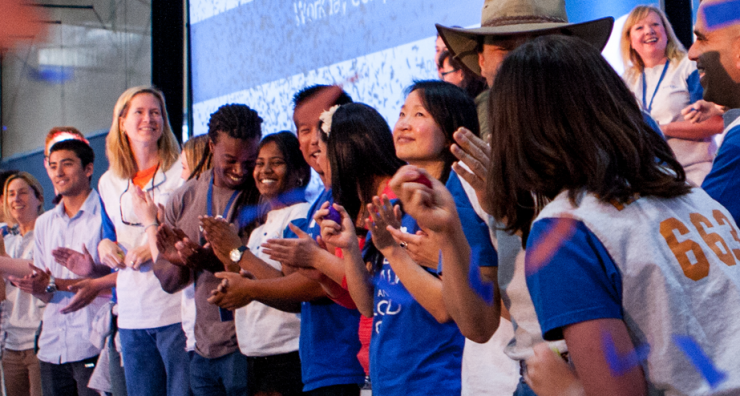 Christensen (third from left) celebrates with colleagues at a Workday company meeting. Christensen as a child on the Tamarac National Wildlife Refuge. Christensen’s father was a game warden at the Tamarac National Wildlife Refuge in Minnesota. 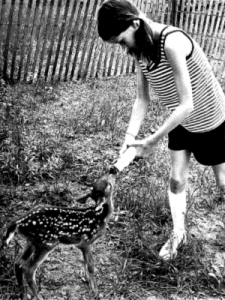 She grew up helping to raise baby deer whose parents had been killed by poachers, and her menagerie of pets included a dog, horse, pig, skunk, and an eagle. After high school, she went to Arizona State University on a basketball scholarship with a plan to study international affairs. Despite feeling that she wasn’t mathematically inclined, she changed majors to computer science because it offered more job opportunities. “I was particularly afraid of calculus,” Christensen says. “So if our professor gave us problems 1-30 to do for homework, I’d do all of those plus problems 31-60. It was a great lesson in that if you work extra hard work, you will succeed.” She earned an A in calculus. After graduating, Christensen accepted a software development job at American Management Systems in Redwood City, Calif., and while there earned her MBA in finance from San Francisco State University. She went on to work at large global companies including American Express and PeopleSoft, where she rose to the rank of vice president of analytics product development; after stints at Oracle and MarketTools, she joined Workday in 2012. “I’ve never worked at a company that is so singularly focused on building the best software products, and doing the best things for customers,” says Christensen. Helen Smith, vice president, product delivery at Workday, admires Christensen’s unwillingness to settle for the status quo. Smith recalls that shortly after joining, Christensen made it her mission to focus on how quickly Workday applications respond when customers perform transactions. Christensen led a review of performance data, looking deeply into any outliers, to determine what to prioritize to reach improvement goals. “Because she drives herself to actively improve the status quo, she encourages her teams to do the same thing,” Smith says. Christensen has twice sailed from California to Hawaii. The vision always has to include a focus on the customer. “It’s important that employees viscerally feel any customer pain, so they can really understand what they’re trying to achieve in their jobs,” she says. 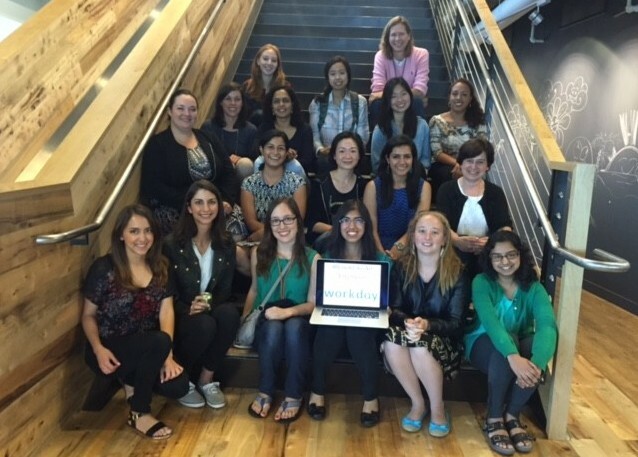 Christensen (top) with some members of Women in Technology, a social and professional group at Workday with a mission to build a community, highlight achievements, encourage growth, and ignite interest in technology among women. Her teams are able to develop and update applications much more quickly than teams she led in the legacy software world, she says, because Workday’s architecture is based on an in-memory database and the toolset is better. But it’s much more than that.